Jobs has saved searches now! (Yay!). However, the nice little number pill indicating how many new jobs fall into the saved search no longer applies across browsers, like the automatically created searches used to do. This means if I check jobs on my laptop in the morning and then check again on my desktop that night, I see a count indicating all of the postings I already saw. Those bottom two don't have anything new since I looked this morning on my laptop. The 10 and 27 ones have a few new ones since this morning, but not 37 total. 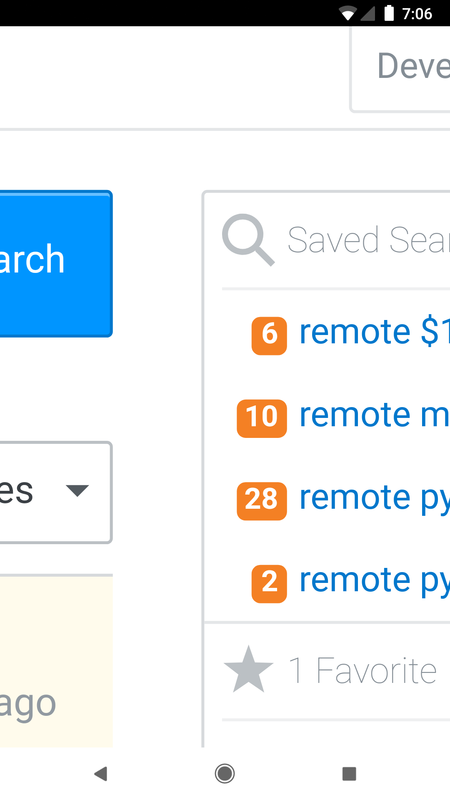 Can the Jobs saved searches indicator be synchronized across a user account instead of per browser? A day later, this is what I see on my phone. I visited all of those saved searches yesterday. Compared to the picture above, it looks like I should only see a few new ones, not these big numbers. never show a "new jobs count" badge if you have viewed this search within the last hour. otherwise, compute the number of jobs that were posted since the saved search was created, and cache that number for an hour. The condition in item 2. was incorrect: it should be "since the saved search was last viewed" and not "since the saved search was created". So, it didn't have much to do with changing device, and everything to do with time passing (and cache expiring). I'm honestly not sure how we missed this (significant) bug until now. It is now fixed, please allow for up to 1 hour before before changes are active. Thank you for your report, and please let us know if you see incorrect counts again.